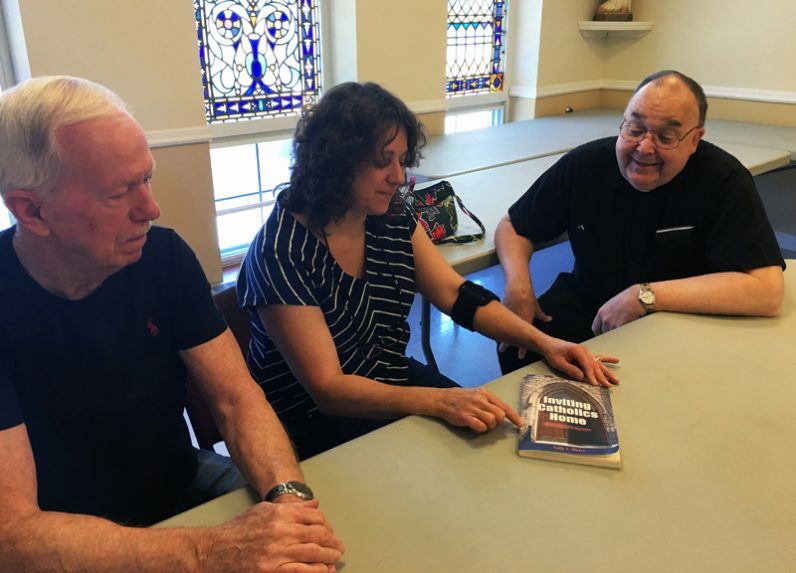 At St. Cyril of Jerusalem Parish in Jamison, Bucks County, the team working to welcome fallen-away Catholics back to the practice of their faith includes (from left) Dan Hartnett, Diane Zisa and Msgr. Robert Powell, the pastor. Catholics who have been away from the faith may long to return but be hesitant to take the first step back. Do they call a church rectory? Show up at a Mass on Sunday? Go to confession? And what if they have circumstances that need to be addressed, like not getting married in a Catholic ceremony or getting a divorce and remarrying without an annulment? They may have many questions keeping them away from the church. Parishes such as St. Cyril of Jerusalem in Jamison, Bucks County, have been trying to help fallen-away Catholics through a program called “Catholics Returning Home.” St. Cyril’s offers the six-week program each year during the Easter season. Dan Hartnett and Diane Zisa, both parishioners at St. Cyril’s, direct the program with the support of their pastor, Msgr. Robert Powell. Zisa said the parish sends notices about the program to neighboring parishes so that Catholics can invite their non-practicing family members and friends. They also have placed signs on the church lawn at the intersection of busy Almshouse and Meetinghouse roads in Warwick Township. The program was developed by Sally Mews of Stevens Point, Wisconsin, who herself had been a non-practicing Catholic. Zisa, who serves on the St. Cyril Parish Pastoral Council and has been involved in religious education for 25 years, said that she attended a session on the program at another church and brought information on it back to her parish. When she informed Msgr. Powell about it, he invited Hartnett to help Zisa coordinate the program at St. Cyril’s. The parish has been hosting the program every year since 2007. “I was a Catholic who returned home,” Hartnett said. He also had experience working with the parish’s Rite of Christian Initiation for Adults (RCIA) program for those interested in becoming Catholics and Powell thought that would be useful for the new program to help lapsed Catholics return to their faith. Together, Zisa and Hartnett try to help whoever turns up for the “Catholics Returning Home” sessions. The attendance has been from two to eight people a year but the coordinators say that even if only one person showed up, they would still offer the program. Some of those who have returned to the church have then gone out and helped others do so as well. As part of the program, Msgr. Powell welcomes those who want to participate and apologizes for any actions by members of the clergy that may have led to people leaving the faith. Then he leaves the room to let Zisa and Hartnett run the program for the next few weeks. The coordinators agree that people who haven’t practiced their faith for a while sometimes feel more comfortable talking to other lay persons when discussing issues about the church. The six sessions follow a prescribed formula. The topics start with a welcome and overview of the series. This is followed the next week by watching a video, “Stories of Faith from Catholics Returning Home;” then “The Church Today: Changes since Vatican II;” an explanation and walk-through of the Mass; “Tips on Sinning,” an explanation of the sacrament of reconciliation/confession; and lastly, “The Creed: What Catholics Believe,” with a wrap-up. All the sessions include time for discussion and sharing. For some, there could be hurts or disappointments, while others may not have a correct or full understanding of Catholic teachings, Zisa explained. When people turn age 50 or older, Msgr. Powell has noticed that they want to get their spiritual house in order and return to the church if they’ve been away. The parish also welcomes people back through an emphasis on the sacrament of penance. “In the Lenten season, we spent a lot of time in the confessional,” the pastor said. If someone needs help with marital issues, Msgr. Powell refers them to the archdiocesan Metropolitan Tribunal, which handles cases involving divorce. He himself has worked on the tribunal for many years. “They have to come and talk. We can’t solve problems if we don’t know they have a problem,” he said. Other parishes have offered the program but Hartnett said St. Cyril’s has stuck with it even in years when attendance was light. He recalled how one participant who was away from the church for 50 years came back, and “he brought other people back,” Hartnett said. “You only need the faith of a mustard seed,” Zisa said. For more information, visit the website of the Catholics Returning Home program or call St. Cyril Parish at 215-343-1288.